Whether you want to enjoy the peacefulness of the remote beaches or top up your tan in the livelier ones, Languedoc has something for everyone’s taste. We offer a wide selection of luxury holiday villas in Languedoc, South of France.This is a guide to some of the best beaches in the Languedoc region and they are only a short drive away from your French holiday villa! The North side of the beach has a parking lot that is very big and free of charge. There are few nice restaurants, night clubs and cafes so it is the perfect spot for everyone. The South side of La Corniche is thinner and has a wilder feeling since there are no buildings close by. Have a look at our luxury holiday villas in Sète, in the Languedoc – they are all close to La Corniche and other stunning beaches in the Languedoc. Situated in Cap d’Agde, this lovely beach with fine sand is a great spot for a day at the beach – it is situated approximately 3km from the centre of Cap d’Agde making it easy to get there if you are renting one of our French holiday homes on the beach. It is one of the best and most popular beaches in Cap d’Agde so make sure to get there early in the morning to get a parking spot. Check out our villa rentals with pool in Cap d’Agde in the Languedoc. 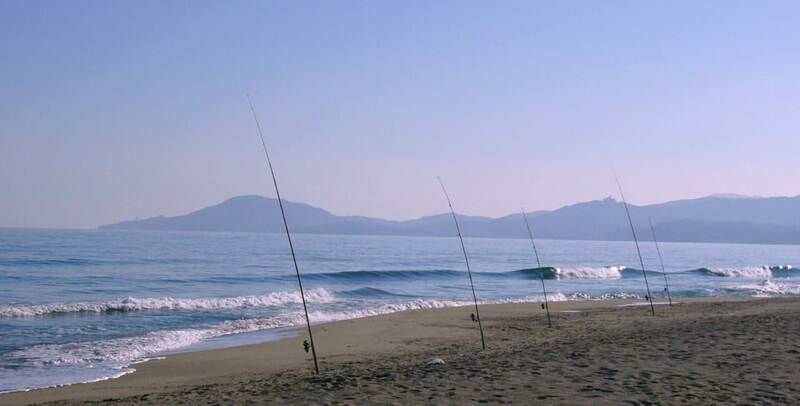 In between Cap d’Agde and Valras Plage, Vias is a sheltered beach with a line of grassy sand banks. The water is shallow and the beach is calm making it the perfect location for families with little children. There are restaurants, cafes and bars behind the beach where you can sit in the shade with a cold drink during the hottest hours of the day. The beach is easily accessible and is approximately a 25-minute drive away from Béziers. Situated right next to Sérignan, the Portiragnes beach is family oriented and relatively quiet. With fine sand and a dog-friendly area, it is the perfect choice if you want to spend the day on a beach that is not massive. There are few bars and restaurants but they are separated from the beach by a car park. Have a look at our holiday beachfront villa for rent in Portiragnes plage. The 3.2km Sérignan beach is the perfect spot for everyone – it offers plenty of space to spread out. The sand dunes at the back protect the beach and give it a wild and remote feeling. There are few restaurants and beach bars behind the sand bank – enjoy a drink or two after a day at the beach! There is a naturist section at the far left of Sérignan. Valras is a good option if you’re looking for a beach that is a bit livelier. It has many shops, bars and restaurants where you can enjoy lunch or have some drinks. It is one of the big town beaches and not as calm as Sérignan and Portiragnes but offers a lot to do. Have a look at our beachfront villas in Valras in the South of France. Situated in the South of Narbonne, it is a very popular beach amongst the wind and kite surfers. The sand is gritty and the beach is separated by a promenade where you can roller skate. Perfect for families since there are nice bars, restaurants and cafes as well as plenty of parking space. We have many holiday villas for rent on the beach, near Narbonne, Languedoc. A massive beach with gorgeous views of the Pyrenees. This beach is often described as one of the best ones in France and it has plenty of space to spread out. Holiday homes and campsites are situated right next to the beach but they are separated by trees and flowers. There are plenty of cafes, bars and restaurants to enjoy lunch or drinks. If you’re feeling adventurous or have had enough of sun bathing, try one of the sea-related activities! We have a selection of luxury holiday villas in Collioure with private pools and within walking distance of the beach. 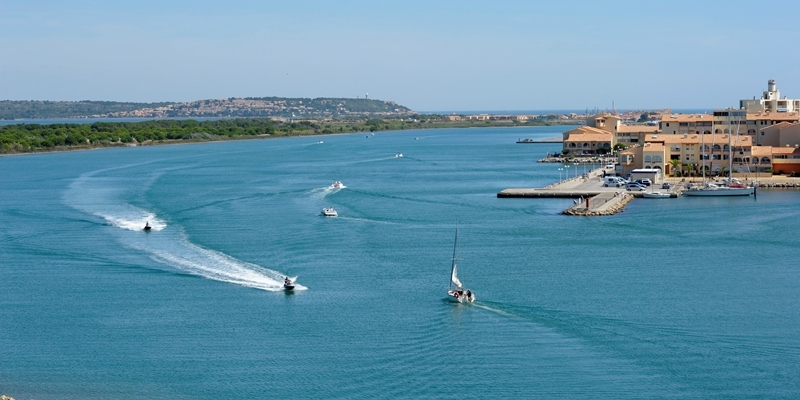 If you want to explore a different type of a beach, try Salagou, Languedoc’s best-known lake. The lake is clean but the water can appear a bit dark because of the nature of the local earth. There are lots of trees around the lake providing shade so you can spend the whole day there. 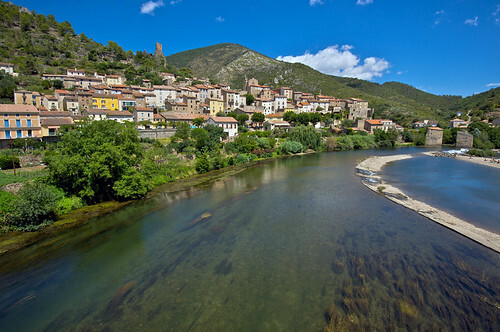 One of the most beautiful villages in France, the Orb river in Roquebrun offers clean and clear water. Flip flops are necessary since the beach and the river bed are stony. Roquebrun is a popular place for canoeing and you can rent them for a few hours or for a couple of days. The village is small but stunning and it has a couple of very nice restaurants where you can enjoy the view over the river. Have a look at our private holiday villas with pool in Roquebrun, in the Languedoc. Book your French holiday villa in the South of France with us! If you want to stay close to La Corniche beach, have a look at Villa Setoise [HE063A], a stunning beach front villa with an infinity pool. It is now on special offer with 20% off the weekly prices in August and September! The sister property [HE065A] Villa St Clair has amazing views, a gorgeous glass fronted pool and is on special offer as well! If you prefer to stay in Cap d’Agde or nearby, we have a wide selection of villas in the area. Check out the beautiful beachfront villa Rochelongue [HE005A] – it has gorgeous sea views and is ideal for families. Another stunning villa that is perfect for families is La Bagatelle [HE061A]. Situated on the Rochelongue beach, this contemporary villa has breathtaking sea views and the most enviable position on the white sandy beach. Les Rocailles [HE044A] is a stunning beachfront villa with heated pool and a large garden making it a perfect family villa. All the local amenities are nearby or right on the beach. If you are looking for a smaller property, have a look at the charming Cap Camarine [HE052A] – it is on the beautiful Rochelongue beach! If you’re looking to stay in Valras, Villa Fabienne [HE004A] is directly on the beautiful sandy beach. The pool is completely fenced and the restaurants, bars and cafes are all within a walking distance. It is ideal for a family holiday in the South of France! If you have many people coming on a holiday in the Languedoc, you can also book the whole property – click on Villa Fabienne [HE004B] for more information. Have a look at Villa St Pierre [HE067A] as well – it is right on the Valras beach and sleeps 8. If you’re interested in staying close to the Port Leucate check out the stunning Laguna Beach Chalet [AU024A] – it is on the beach and has been renovated recently. It is the perfect location for your holiday in the South of France! For those wanting to stay in the stunning village of Roquebrun, La Grange [HE083A] is a lovely Provencal style farmhouse only a few steps from the River Orb. It is spacious and has breathtaking views over the river. When you’re looking for a bigger villa in Roquebrun, Maison Mimosa [HE074A] is the perfect choice – it sleeps 14, has a sauna and a heated indoor pool and the river beach is right next to this Languedoc house! If you would like to find out more about any of the featured properties above, or any of our other holiday villas in the South of France, Corsica or Morocco, please don’t hesitate to get in touch!